After the fun we had with Tezuka Month, I found myself tempted by a complete 13-episode box set of Phoenix: Perfect Collection sitting by itself at a convention. What I discovered was a Tezuka-style story in a digitally-glossed over aesthetic that seems a bit out of place, but stands true to the original work. Even with some slower, epic moments, Phoenix is a wonderfully crafted story with as many highs and lows as the original manga volumes. The opening animation, with its classical orchestra and ominous female solo over the opening credits, already dictates a story of philosophical ambition as the Phoenix flies out of an infant galaxy, across a space Buddha, and into the corona of a sun that becomes a metaphor for ... wait for it Lion King fans ... the circle of life. Phoenix follows the main stories of the manga collection by Osamu Tezuka in arcs that run from one to five episodes in length. Beginning with the largest story, Dawn, the series leaps in time back and forth by thousands of years, going from ancient times to the end of mankind and planet Earth itself. 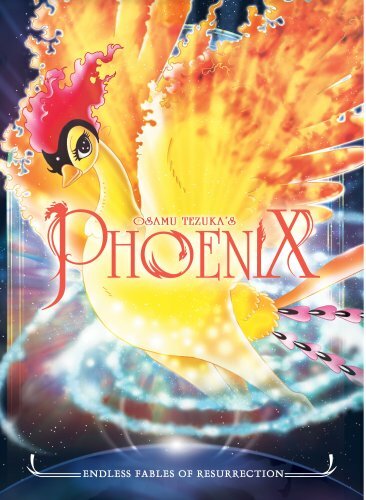 Other than the recurring role of Saruta, Tezuka’s stock tragedy character with the melon-sized blistered nose, Phoenix does not center on any one character, rather it follows how they are all affected by the title character, the elusive and sparkly Pidgeot, also known as the Phoenix. The longer stories are my favorites since they have the chance to grow and change, evolving from supernatural to political drama to war movie with the grace of a swan flapping its wings. The story of Inugami, a member of a royal family whose face is replaced with a wolf’s, was one of the most compelling pieces as the lines between man and monster are blurred while Tezuka kicks organized religion right in the gonads. The shorter stories act as allegories about the injustice of killing one to save many: in both cases, the Phoenix grants her gift of immortality as a cruel, Twilight Zone-esque punishment. The show has a big animation budget, with lighting and shading effects almost taking center stage during some action scenes, although the movement and kinetic energy are captured and translated superbly from Tezuka’s original layout. What throws me off is how out-of-place a Tezuka design looks in full color. For some reason, I can’t get over a Tezuka character design placed in front of a realistic setting; the facial proportions are too larger-than-life to ignore. I was very surprised to find Media Blasters in charge of the dub, and even more blown away by how well it was executed. Recorded at NYAV Post in New York City, a handful of A-list dubbers were called in for lighter roles, with studio director Mike Sinterniklaas pulling his weight throughout the series. The highlight goes to the diversity of Danny Burstein, who alters Saruta’s aggression and passion throughout the story as both the times and the character age. This is a very competent and well-translated dub which made me ignore the original Japanese track entirely. I even turned off the subtitles when I realized how much more coherent the English speech track was by comparison. What I am most thankful with for this re-imagining is its honesty to the source material, in that every story hammers home the defining instincts of mankind: survival, war, transformation leading to rebirth, and robots. This review is based on a retail copy of the Media Blasters DVD box set, purchased by the reviewer.